Character. Cost: 3. STR: 6. 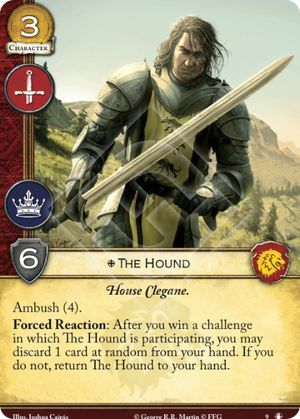 Duplicates can save from anything that causes a card to leave play, such as the Hound's forced reaction. However, if you dupe the Hound and then decline to save from his forced reaction, the dupe is lost and sent to the discard pile. See "Leaves play" in the RRG. You can dupe the Hound normally, for free during the marshalling phase. Or you can pay the ambush cost to ambush a second copy of the Hound during the challenges phase, in which case it will enter play as a duplicate. It's perfectly legal to ambush the Hound more than once in a single phase, provided you have the gold. Make no mistake, the Hound is a beast (pun 100% intended). The gold to strength ratio is insane not to mention he is a bicon AND has the ambush keyword. His downside isn’t even necessarily a downside, making him basically immune to Tears of Lys and negative attachements.